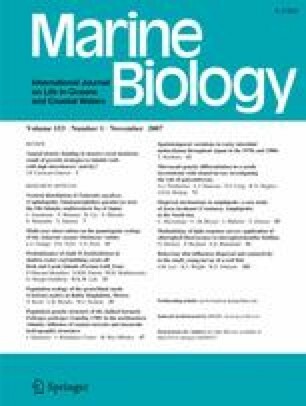 The diel vertical distribution patterns of Japanese common squid, Todarodes pacificus, paralarvae were examined using a Multiple Opening Closing Net and Environmental Sensing System (MOCNESS) in the southwest Sea of Japan near the Oki Islands (Japan) during five late-autumn surveys in 1998–2002. A total of 1,511 paralarvae ranging in mantle length (ML) from 0.7 to 7.3 mm were collected at 63 of the 68 stations surveyed. Most (84%) were collected above 75 m depth and in the mixed layer. The vertical distribution patterns varied little between day and night. Hatchling-sized (<1.0 mm ML) paralarvae were abundant at 0–25 m depth, and paralarval ML increased with increasing sampling depth. Our results suggest that T. pacificus paralarvae do not exhibit large diel vertical migration patterns, but as they increase in size, paralarvae gradually descend in the water column and the variability in depth increases with ontogeny. We thank the crew of the R/V Tottori Maru No.1 and K. Ito, C. Higashimori, Y. Yoshioka, R. Chiba, and A. Suzaki for help sorting and collecting the plankton samples. J. Napp and J. Bower provided valuable comments on the manuscript. We also thank J. B., G. Taub, and A. Buchheister for their English language support. The manuscript was greatly improved by the constructive comments of three anonymous reviewers.